Highland has entered into an exclusive agreement to invest in L2Fiber Rotterdam. 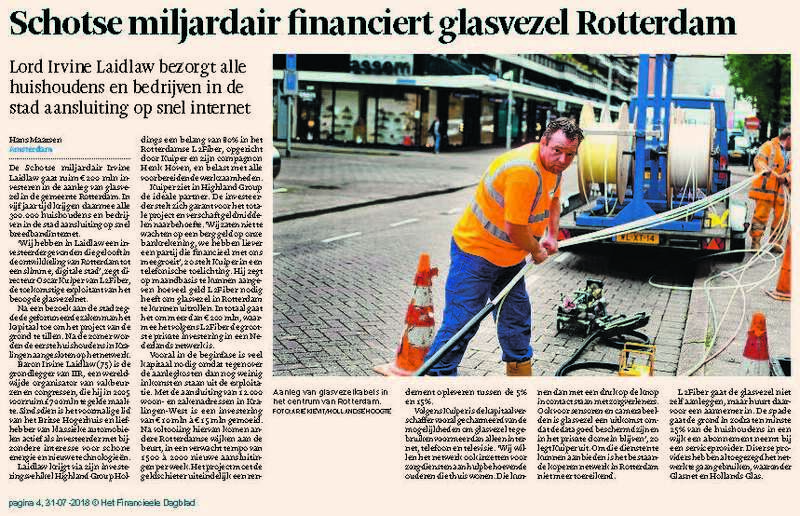 The company plans to bring optical fiber access to all 295,000 homes in Rotterdam over the next 5 years, starting with the 10,000 homes of Kralingen-West in August. We are thrilled to partner with Highland, whose investment will ensure that the project is supported by a reliable and reputable infrastructure investor. The network will change the way Rotterdammers experience the Internet and use the other services provided through the network, from live online gamers needing the quickest response to the elderly requiring secure 24h remote health monitoring. We are very excited about this opportunity to extend fiber coverage in the Netherlands, starting with the city of Rotterdam. We have found a great partner in L2Fiber, whose team combines strong entrepreneurial drive with the most up-to-date technological expertise. We look forward to working with them to provide citizens and businesses with access to high-quality internet and data services. The partnership is delighted to start rolling out the network in Rotterdam and intends to deploy similar networks in other Dutch cities that have shown interest. L2Fiber Rotterdam is the only optical fiber network of its size in Europe to be developed exclusively by private investors. The network will be open to all service providers to deliver ultra-fast internet and high-quality television and telephony at competitive prices to the inhabitants of Rotterdam. Service providers Glasnet, Hollands Glas, SNLR, Teleplaza and TriNed have already announced that they will use the network to provide reliable internet at speeds of up to 1 Gbps. L2Fiber Rotterdam will also make the network available to providers of other services such as eHealth and security. The network will use GPON technology, allowing a single fiber line to deliver connectivity to multiple users. This access method will not only reduce network complexity and maintenance requirements, but also save on energy consumption and upgrade costs. The City of Rotterdam encourages the installation of high-speed, high-quality digital networks and welcomes the initiative of L2Fiber Rotterdam to deploy an optical fiber network in the city. This infrastructure will enable citizens and businesses to develop and use next-generation services such as home automation, telemedicine, and cloud computing. - Future-proof service scalable to 10/40 Gbps anticipating 8K movies, high-res VR and UHD game streaming. Highland was advised by M&A advisor IMAP Netherlands and law firm AKD. Green Giraffe advised L2Fiber Rotterdam in the development and financing of the project, while Clifford Chance advised on the legal and contractual aspects. The IMAP deal team consisted of Axel Fuhri Snethlage, Willem op de Hoek and Daan Zandbergen.